Last Friday was my dad's birthday and I decided to cook one of his favorites. 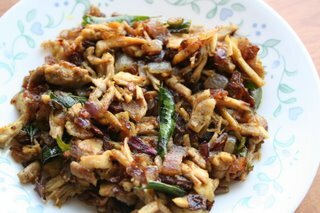 It took me a long time to decide what to make and finally chose to make pichu pota kozhi fry (shredded chicken fry). My dad took us often to a restuarant called Ponnuswamy in chennai. Most of the times he would order this dish and so I thought why not try this dish out. I did not have a recipe for this but just went with my instincts and came up with this dish. It did come out well and I am sure I will be making it often in the future. So this one is exclusively for my dad. Boil 2 cups of water and add salt, turmeric and the chicken pieces and let cook for 15 min. Remove chicken from water, let it cool and then shred into small pieces by hand. Heat oil in a pan and add chopped onions and sliced green chillies. Fry till the onions turn golden brown and then add curry leaves, shredded chicken, coriander powder, cumin powder, pepper powder and salt. Fry in low heat till the chicken pieces are coated well with the masala and the dish becomes dry. Serve hot with rice and sambar. Infact it tastes good just by itself. I think your recipes are just awesome. Have you thought about adding the serving size for recipes? That would be very helpful. Shaheen: Been a little busy at work. Will try and update often. Anonymous: Thanks. Thats a good suggestion will definitely try to do that in the future. Hope your dad had a great Birthday! Hey Deepa, I wish I were your neighbour. I am missing all the good food! hey deepa, i think your dad's has a great taste!! :) for the past 4 days i am down with viral fever, so i took the chicken and made some soup for myself and with the chicken i did the pichi pota chicken..i love the sound of it....and made some sandwiches for my hubby..it was a hit!! thanks dear for the wonderful recipe! !